Psychologist Abraham Maslow is best known for his theory about human motivation, aka the hierarchy of needs. He believed that basic needs must be fulfilled before an individual can progress to higher levels. For example, an individual cannot realize their self-potential ( the highest level ) if the basic necessities of food and shelter are not met. Anyone who’s ever taken a Psychology 101 class is familiar with the conceptualized pyramid denoting the levels. Well, it struck me that writers have a hierarchy of needs of their own that must be satisfied before they can hope to achieve creative greatness. Physical needs: Writers don’t need much–our minds are full enough. However, coffee to awaken the Muse, snacks for feeding the Muse, a computer ( or notebook and pen in a crunch ) and the happy hormones found in chocolate are writing staples. Love & Belonging: We might be solitary folk, happy retreating into our creative cave, yet we need the fellowship of FaceBook , Instagram, Google +, LinkedIn, and Twitter. We seek validation not only from other writers but from reviewers, readers, and friends. There is safety in numbers, in belonging to groups where the written word reigns supreme and reading is revered! Esteem: We are fragile sorts, our egos crushed daily by plot flaws, meager word count, and scenes refusing to flow. So thus we turn away from the story, casting our attentions to the Likes, Tweets, ReTweets, and hits on our social media. Sadly, they validate us, at least for the moment. And when our confidence is lifted by enough Likes and RT’s we venture back into our novel. Self-Actualization: Having attained our needs we are now eager to plunge into the story. We conjure the Muses and force them to do our bidding. Words flow from our brain, pass the heart, and course through our fingertips. Reality vanishes and we are happy, our Zen restored. So should you experience the horrors of writer’s block, fear not! 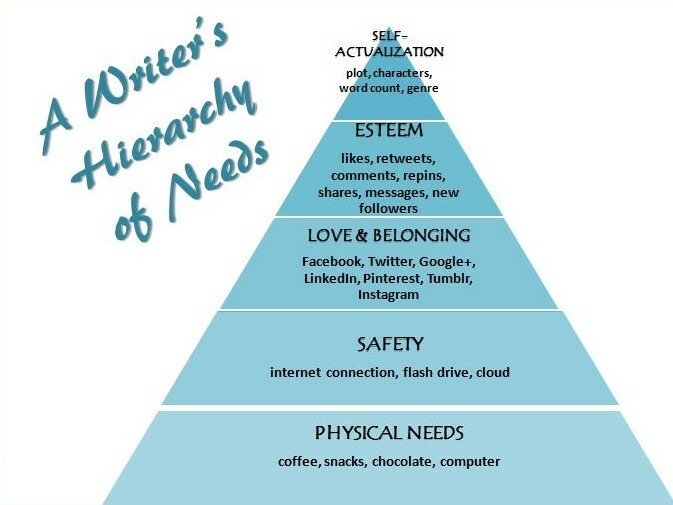 Your Pyramid of Writer’s Needs is not being met! This entry was posted in Reading & Writing, ROCK your Writing and tagged a writer's life, craft of writing, LZMarie, writing advice, writing blog, writing tips on November 16, 2014 by lzadmin. It was the best of times. It was the worst of times! Oh, the drama of the family meal! People eating and drinking together is tasty with yummy symbolism. Why is that, you ask? In ancient times, sharing one’s meal symbolized hospitality and goodwill. Certain foods, drink, or days were associated with religious and social rituals. If one was breaking bread with someone, it indicated friendship, truce, partnership, or an alliance. The human race hasn’t changed all that much—we still enjoy eating with those we like–and eschew eating with those we don’t. Eating and/or fasting rituals are found in most religions. And I can’t think of a holiday that doesn’t center around or end in eating! Eating together & sharing food is an act of communion/agreement/fellowship/harmony. 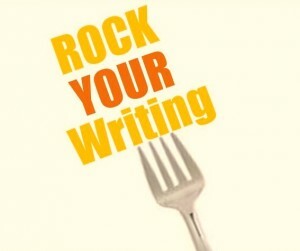 Writing a meal scene is challenging, but can reveal much about the plot, character, relationships, family dynamics, setting, or culture of the novel. Who is sharing the meal? Enemies? Lovers? Family? Strangers? What foods are they eating? Is the food and drink symbolic of religion or social class, OR is the food itself fraught with symbolism. See the posts Fruit of the Gods, Sacred Spices, and Foods of Life for information regarding the symbolism of some common foods. In the Merkabah Series, there are several eating scenes–each revealing something about the characters and their relationships. One character orders a flambeed dish. Yep! You bet it’s symbolic. Why is this particular meal described? 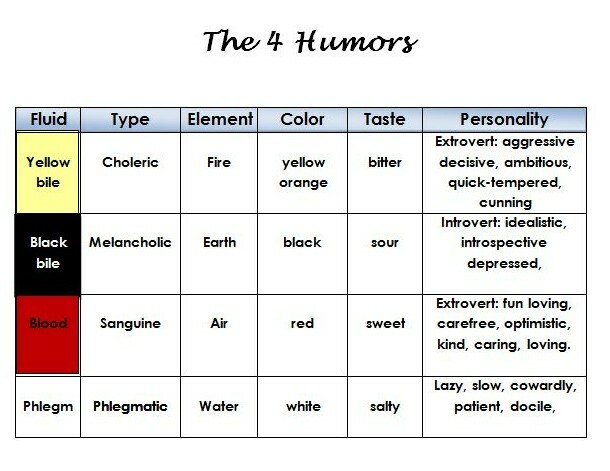 Why is it significant to the plot/character? How does the meal end? Did someone choke? ( plot device or sign of character “choking” on their own words or that of another’s). Did someone stalk off—an indication the communing/fellowship/agreement went wrong. Remember the scene in Great Gatsby when Tom jumps up from the table to take a phone call from his girlfriend? Does a character take food from another’s plate? Do they refuse to share? Do the characters share a utensil, straw, or drink ( either accidentally or with purpose). What’s happening under the table? Hand-holding, clenched fists? Is a character refusing to eat? In effect saying, I’m here with you, but I don’t like/approve of you. An eating scene is full of chewy symbolic deliciousness. Have fun feeding your characters! This entry was posted in Reading & Writing, ROCK your Writing and tagged acts of communion, analyzing literature, craft of writing, eating symbolism, literary analysis, LZMarie, meal symbolism, meals in novels, novel writing tips, rock your writing, symbolic writing, writing blog, writing with purpose, writing with symbolism on October 16, 2013 by lzadmin.